An edible one to warm your little soul! Am I freezing right now? Yes, probably. We’re trying to combat that with this bowl of lovin’. Am I wearing weather-inappropriate yoga capri leggings and short uggs to make my own very terrible fashion statement? You betcha. Did I learn how to drizzle oil on top of soup in a pretty, uniform way just to take these pictures? Noooo. No patience here. This soup is downright SILKY. The potatoes and roasted garlic and drop of cream get all pureed and whipped until a spoonful truly melts in your mouth. And now here’s my thing: what’s soup without some texture? I don’t think it’s any secret that I’m a pretty huge proponent of that. Apparently I have issues with soup and crunchy toppings. Texture freeeeak. So much so that I went back and forth on whether I should do crispy brussels or crispy onion straws. Let’s be real: both would totally work. Both could even work together if you have the time and patience. Both would add excellent flavor – but I went with the brussels since they are still in season and I completely lose my mind over them in every aspect of the sprout. 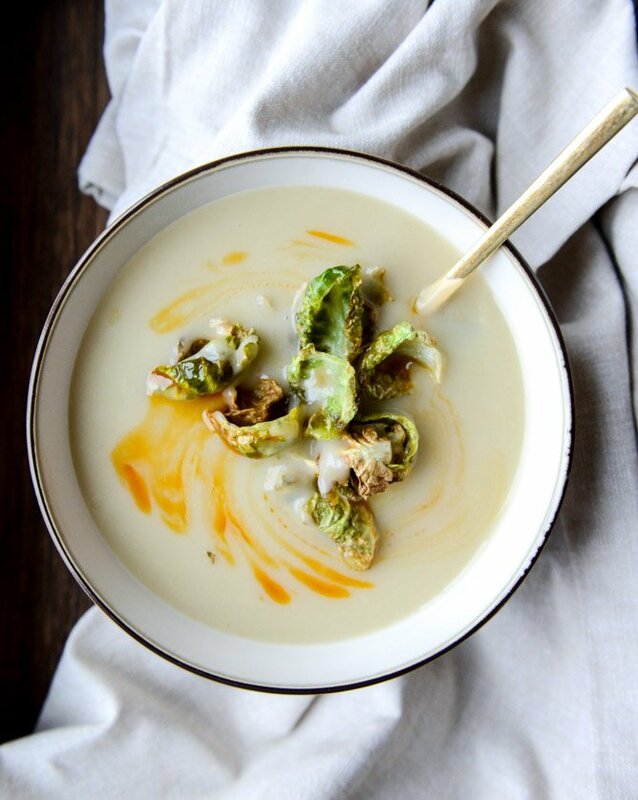 Last year I fried brussel sprouts and served them with a killer aioli. 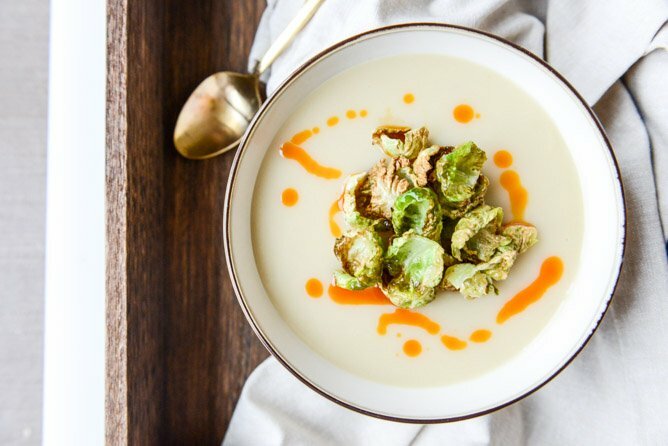 This year I fried brussel sprouts and popped them on soup. Now… there is major depth of flavor in this soup with everything going on, but of course I can’t let anything be. So I took a few drops of the chili oil from one of my favorite chicken dishes and drizzled it on top. Pure perfection. At least for my wacky taste buds that need, like, four hundred (normal) things going on in a recipe. Completely normal. Heat a large stock pot over medium heat and add olive oil and butter. Once melted, stir in the onion with a pinch of salt and cook until softened, about 5 minutes. Add the potatoes and enough stock to cover the potatoes – starting with 4 cups and using more if needed. Bring the mixture to a simmer. Cover and cook until the potatoes are tender and falling apart, about 20 to 30 minutes. Turn off the heat. Carefully add the mixture to a blender. Squeeze out the roasted garlic cloves and add them to the blender too. Puree the soup until totally creamy and smooth. Pour the mixture back into the pot and heat over low heat. Add the cream, salt and pepper. Taste and season additionally with salt and pepper if needed. Serve the soup and drizzle the chili oil on top. Add the brussels as garnish and eat! While the potatoes are simmering, heat a pot over medium heat and add the vegetable oil. Attach a candy thermometer if you have one – you want the temperature to be around 325 to 350 degrees – no higher! Add the brussels sprouts leaves a few handfuls at a time and fry until crispy, about 2 to 3 minutes. Remove with a slotted spoon and place on a paper towel to drain, covering with salt and pepper. Omg, I love this soup. It was exquisite. Very elegant flavors. I had to try it but I didnt have the Brussels. I had kale so I fried the Kale and added some roasted garlic slices on top. Delicious. I just made this and it’s amazing. Amazing. Amazing. I have tried recipe after recipe for potato soup and been disappointed every time – too brothy or too heavy. This one seems to have the right thickness. I made this last week for a “soup day” at work at it was a hit! Everyone loved it and it was very filling. My recreating of the soup, however, was MUCH thicker than shown in the photos. I’m not sure what happened, but it was almost the consistency of mashed potatoes. I even added an extra 2 cups of broth (since the amount suggested didn’t cover the potatoes completely as instructed) and it was still incredibly thick. Any idea why it was so thick? I followed everything else precisely. Other than that slight hiccup, I didn’t make the oil or brussel sprouts, but I did add a healthy serving of Trader Joe’s “African Smoke” seasoning to it and it gave it a great flavor! Pingback: слово недели – пропонент | Хорошо.Громко. Hey, I’d really like to try your recipe, but I’m not a fan of frying. You think I could coat the leaves in oil and get them crisp in the oven? Has anybody tried that? Put it all together and what do you get? Deliciousness!